Before he did, however, his life was filled with early hardship. An 18-year-old laborer residing in Landisburg, Perry County, Pennsylvania at the dawn of the Civil War, he was the son of Tyrone Township natives, Jesse and Catherine (Kiner) Ewing. His father supported the family as a farmer and brick maker, and was active in civic circles as “a leading member of the Know Nothing party in Perry county, where he served as assessor of his township,” until passing away at the age of 35. Forced by those circumstances to leave school early, William H. Ewing became a 12-year-old farm hand in 1855. On 2 September 1861, at the age of 18, William H. Ewing enrolled for military service. He then mustered in at Camp Curtin in Harrisburg, Dauphin County as a Private with Company D of the 47th Regiment, Pennsylvania Volunteer Infantry. His Civil War Veterans’ Card File at the Pennsylvania State Archives states that his age at the time he joined up was 20, indicating that he had possibly falsified that age to make himself appear two years older. As part of the 47th Pennsylvania Volunteers, Private Ewing and the men of Company D officially became part of the federal service when they mustered into the U.S. Army on 24 September. On 27 September, a rainy, drill-free day which permitted many of the men to read or write letters home, the 47th Pennsylvania was assigned to the 3rd Brigade of W.F. Smith’s Army of the Potomac. That afternoon, they marched to the Potomac River’s eastern side and, after arriving at Camp Lyon, Maryland, marched double-quick over a chain bridge before moving on toward Fall’s Church, Virginia. Arriving at Camp Advance at dusk, they pitched their tents in a deep ravine about two miles from the bridge they had just crossed, near a new federal military facility under construction (Fort Ethan Allen). Armed with Mississippi rifles supplied by the Keystone State, they joined the 3rd Brigade and Smith’s Army of the Potomac in defending the nation’s capital. By the afternoon of Monday, 27 January 1862, the 47th Pennsylvania Volunteers had commenced boarding the Oriental. Ferried to the big steamship by smaller steamers, the enlisted men boarded first, followed by their officers boarded. Then, per the directive of Brigadier-General Brannan, the Oriental steamed away for the Deep South at 4 p.m. They were headed for Florida which, despite its secession from the Union, remained strategically important to the Union due to the presence of Forts Taylor and Jefferson in Key West and the Dry Tortugas. In early February 1862, Private William Ewing and his fellow 47th Pennsylvanians arrived in Key West, where they were assigned to garrison Fort Taylor, drilled daily in heavy artillery tactics, built new roads, and improved the federal facility’s fortifications. Sometime during this phase of service, he suffered an episode of sunstroke severe enough to require that he be confined to the post hospital at Fort Taylor. This may have occurred as early as March 1862. His Beers’ sketch states that his hospital stay lasted 10 months; however, this biographical profile contained several key errors, including mistakenly listing his date of discharge from the 47th as December 1862. State and federal military records document that Private William Ewing was released on a Surgeon’s Certificate of Disability from Fort Taylor, Key West, Florida on 26 November 1862. * Note: His Beer’s sketch indicates that he served with “Company D, 207th P. V. I., under Capt. L. Deagon [sic] and Colonel Albright”; this was only partially correct. The listings for William H. Ewing in the Civil War Veterans’ Card File at the Pennsylvania State Archives and the U.S. Civil War Pension Index document that he served both with Company D of the 47th Regiment, Pennsylvania Volunteer Infantry and with Company B of the 202nd Regiment, Pennsylvania Volunteer Infantry. The latter duty was performed under regimental commanding officer Colonel Charles Albright, and Captain Lewis Degan, commanding officer of B Company, 202nd Pennsylvania. Bates’ History of Pennsylvania Volunteers, 1861-5 further confirms this, and notes that Private William H. Ewing served with the 202nd Pennsylvania from 2 September 1864 until mustering out with his company on 3 August 1865. Following basic training at Camp Couch near Chambersburg from 3-23 September 1864 and an additional three-day march, Private William H. Ewing and his fellow members of the 202nd Pennsylvania Volunteers were shipped by rail to Washington, D.C., and ordered to Alexandria, Virginia at month’s end. There, they were assigned by General John Slough, the Union’s Military Governor of Alexandria, to guard the trains and tracks from Rectortown to Thoroughfare Gap, along the Manassas Gap Railroad which was heavily used by General Philip Sheridan for his 1864 Shenandoah Valley Campaign (a campaign in which Private William Ewing’s former comrades in the 47th Pennsylvania had fought well just days earlier during the Battles of Opequan and Fisher’s Hill). The guard assignments performed by Private William Ewing and his fellow members of the 202nd Pennsylvania, while not performed under the heavy fire of battle, were still hazardous. The railways in the area were responsible for transporting supplies to maintain Sheridan’s armies and, as such, were frequent targets not only of Confederate soldiers, but of local residents attempting to sabotage Union operations. Guards from the 202nd risked sniper fire or death in the prisoner of war camps at Andersonville or Salisbury if captured. 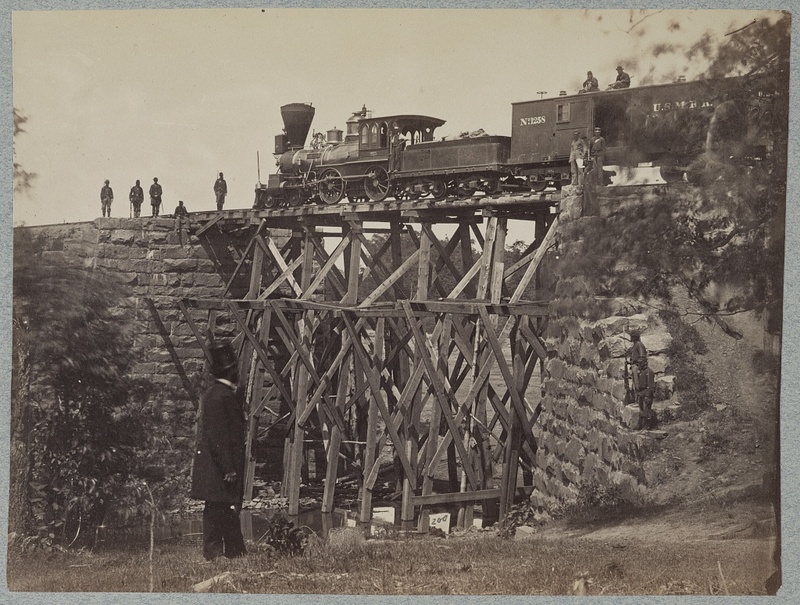 Bridge and Train, Orange and Alexandria Railroad, c. 1861-1865 (Library of Congress, public domain). In between skirmishes with Rebel troops at Salem on 8 and 16 October 1864, the 202nd Pennsylvania burned buildings and arrested key community leaders known to be loyal to the Confederate States of America in response to the Rebel derailment of a train on 10 October, which resulted in significant loss of life and other casualties. That Fall of 1864, following Sheridan’s 19 October win at Cedar Creek, the 202nd was ordered to dismantle the tracks they had been protecting, and transfer the materials to Alexandria. From that period on until May 1865, they camped at Alexandria, Virginia, and guarded the Orange and Alexandria Railroad’s Alexandria to Bull Run stretch. Ordered to Philadelphia in May 1865, the 202nd Pennsylvania joined the army headed by General George Cadwalader, and was assigned to Provost (military police) duties relating to the anthracite coal facilities in and around Tamaqua in Schuylkill County, Pennsylvania. On 3 August 1865, Private William H. Ewing and his fellow B Company members of the 202nd Pennsylvania Volunteers were officially mustered out of service, and shipped home. Returning to Perry County, Pennsylvania following his honorable discharge from the military that Summer of 1865, William H. Ewing worked for a tannery and then began work as a hoopmaker. On 3 January 1867, he was united in marriage by the Rev. John Peter Shindel with Elmira A. Middleswarth at Middleburg, Pennsylvania. Born in Beaver Township in Perry County in January 1843, Elmira (Middleswarth) Ewing was a daughter of Abner and Sophia (Bickel) Middleswarth. Together, William and Elmira welcomed to the world sons Jesse, Theodore, Francis and Charles, and daughters Jane, Etta and Carrie. Relocating to Snyder County in 1867, and settling near Adamsburg, William supported Elmira as a hoopmaker until 1869 when he tried his hand at carpentry. Leaving that field in 1871, he found work at a sawmill. Sometime during this phase, he and Elmira moved to a small farm in Beaver Township. By 1875, William Ewing and his family had headed west in search of a better life. Homesteaders facing hard times in Kansas, they returned to Snyder County with little money and few possessions in the Spring of 1878 where, at Lewistown, William rebuilt their support base as he managed his father-in-law’s farm. Just eighteen months later, William and Elmira Ewing were able to purchase 96 acres of land in Spring Township, Perry County, which William populated with peach trees. As his orchards grew, he and his family prospered. William and Elmira raised a new house, barn and more children. In March 1884 and August 1886, they welcomed sons George and Ira, respectively. By 1900, William and Elmira Ewing were still residing in Spring Township, Snyder County, Pennsylvania with sons George and Ira, and granddaughter Nettie Patterson (born in Pennsylvania in November 1894). William’s wife, Elmira Ewing, filed for his U.S. Civil War Pension on 6 August 1918. Although widows’ pension applications typically were filed in the same year in which the husband-veterans died – and although William Ewing’s Pennsylvania Veteran’s Burial Index Card states that he was buried at the Liverpool Union Cemetery in Perry County, Pennsylvania (without a grave marker in the same year in which Elmira filed for his pension – 1918), William H. Ewing died in Beaver Springs, Snyder County, Pennsylvania on 29 July 1912, according to his gravestone. He and his wife, Elmira (who passed away in Beaver Springs on 19 April 1926), were interred at the Adamsburg Cemetery in Beaver Springs, Snyder County, Pennsylvania. 2. Beers, J. H. & Co. Commemorative Biographical Record of Central Pennsylvania. Chicago: 1898. 4. Pennsylvania Veteran’s Burial Index Card. Harrisburg: Pennsylvania Department of Veterans Affairs. 6. U.S. Civil War Pension Index (application no. : 358494, certificate no. : 372964, filed by the veteran on 26 April 1880[? ]; application no. : 991297, certificate no. : 749566, filed from Pennsylvania by the veteran’s widow, “Ewing, Elmira,” on 6 August 1918). Washington, D.C.